It was very close to the bus station and the city center. It was very convenient to take the bus to the airport and to Marseille. The location is very close to the center of the city. Quite a reasonable sized studio appartment. The staff were very friendly and helpful. We stayed at 20 plus hotels on this trip. This was one of the 3 best we stayed at. Great balcony, pool, breakfast, staff, location. The hotel has air conditioning, a quiet location within a short walk of the bus station and town, and has tea and coffee making, micowave, sink and fridge in the room. The room was quite small for two people but OK as we were only staying one night. The bed was comfortable. There is secure underground parking. The staff were very helpful. It is located at place where takes 5-minute walk to old town, yet at a quiet area. The room is clean, bright, and comfortable. The apartment very comfortable and functional, especially the small cooking facility, vicinity of a good store, nice big terrace where we could rest and eat. Close to the city centre. 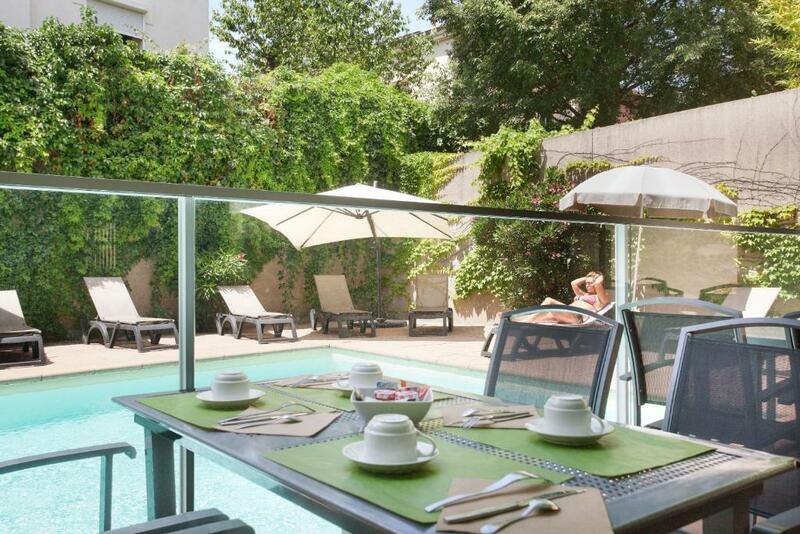 Lock in a great price for Odalys City Aix en Provence Les Floridianes – rated 8.3 by recent guests! Odalys City Aix en Provence Les Floridianes is located a 5-minute walk from the cafes and fountains that line the Cours Mirabeau. It offers guest rooms and self-catering accommodations with 24-hour reception and an outdoor swimming pool during summer. Free Wi-Fi access and a flat-screen TV with satellite channels, including BeIN Sport, are provided in the accommodations, which also has seating area. 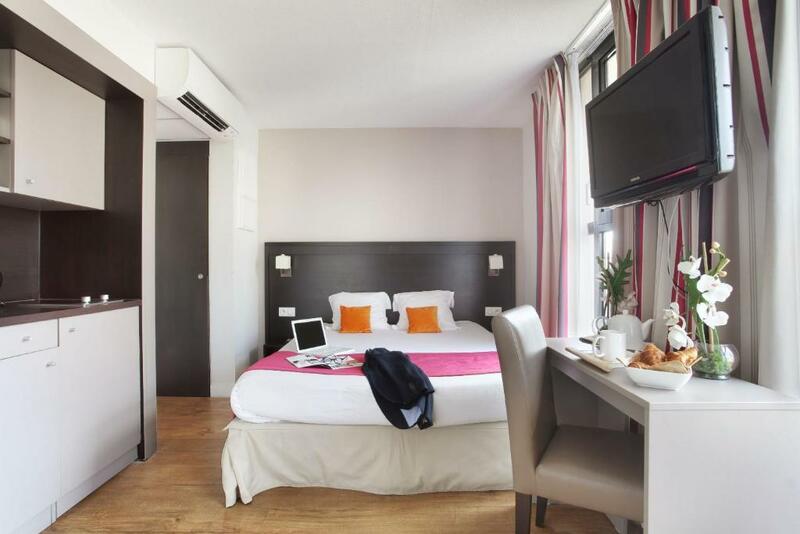 All of the air-conditioned rooms and suites at Odalys City Aix en Provence Les Floridianes have a private bathroom. The fully equipped kitchenette in the apartment includes a dishwasher, microwave and a small dining area. 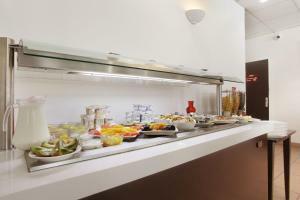 Les Floridianes also serves a buffet breakfast in the dining room which opens onto the terrace surrounding the pool. Gare d’Aix-en-Provence Train Station and Jourdan Park are both 1,650 feet from the residence. The A8 Motorway is 1 mi away. Undercover parking is available on site with a supplement. 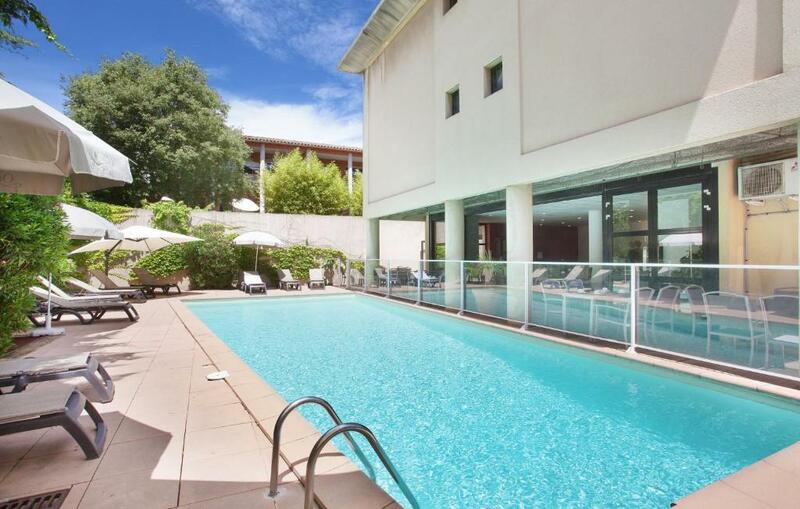 뀐 Located in the top-rated area in Aix-en-Provence, this property has an excellent location score of 8.6! 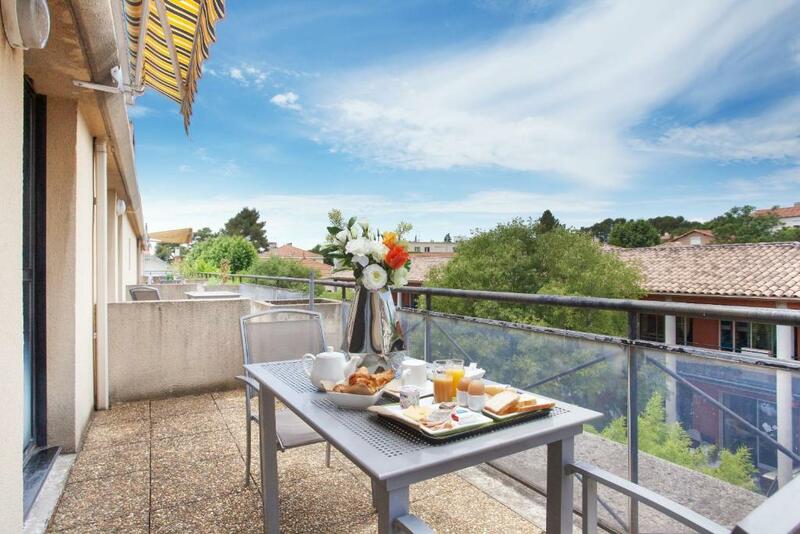 When would you like to stay at Odalys City Aix en Provence Les Floridianes? This air-conditioned room features a lounge area with a sofa bed and a flat-screen TV with satellite channels. The private bathroom includes a hairdryer and free toiletries. This room features a flat-screen TV with satellite channels and air conditioning. The private bathroom includes a hairdryer and free toiletries. This apartment includes cooking facilities, free Wi-Fi access and a bathroom with a bathtub. 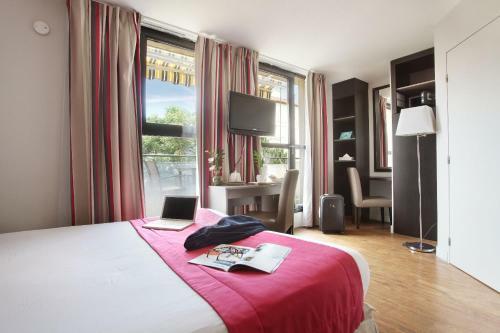 In the center of Aix en Provence just 8 minutes walk from the main square " La Rotonde " and the famous " Cours Mirabeau" , you have the benefits of downtown without the noise. 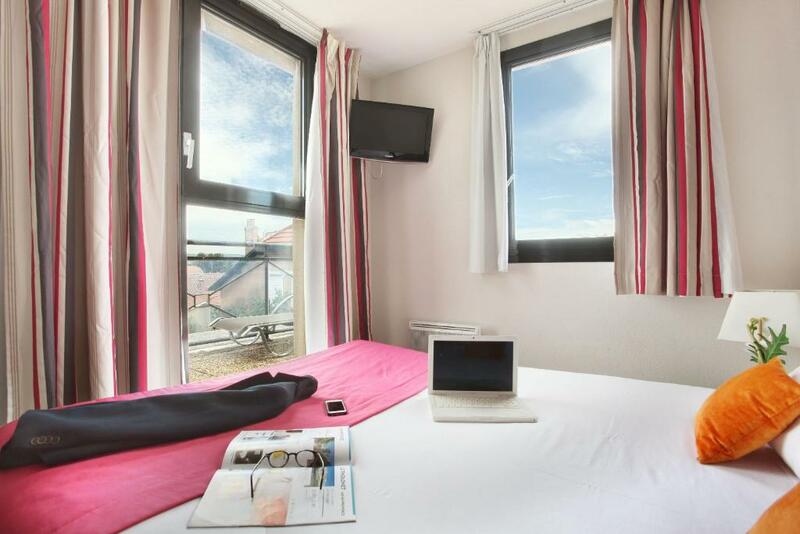 Appart'Hôtel Odalys Floridianes is close to shops, taxis , bus station and univesities . Many visits of the historic center and museums are also within a few minutes. House Rules Odalys City Aix en Provence Les Floridianes takes special requests – add in the next step! Odalys City Aix en Provence Les Floridianes accepts these cards and reserves the right to temporarily hold an amount prior to arrival. Please note that there is a height limit of 6.6 feet for cars in the car park. Please note that guests must produce a valid credit card and a piece of photo identification upon arrival and that the name on the credit card and photo ID must be the same as the name on the reservation. Management reserves the right to refuse the reservation if these conditions are not respected. For stays of 1 to 4 nights, daily cleaning is included in the price. For stays of 8 nights or more, weekly cleaning including a change of bed linen and towels is included in the price. For stays of 5 to 7 nights, a cleaning service is available upon request and for an extra charge. The outdoor swimming pool is open from mid-April until the beginning of October. Please inform Odalys City Aix en Provence Les Floridianes of your expected arrival time in advance. You can use the Special Requests box when booking, or contact the property directly using the contact details in your confirmation. It's not fault of the hotel but it was extremely difficult to drive there. Google was better than the car navi. Once you find the entrance of the road it is simple. SPAR was there. The room is wide enough but a bit badly organized but it was not a big deal. The staff was extremely helpful! Space was wide enough. On site secure parking. Since our apartment was not cleaned during our stay, it would have been good to have been provided with a broom, dustpan and brush. Great little kitchen. Comfortable bed. Good hot water. Plenty of space. Quiet location in cul-de-sac. The kitchenette is ok for making breakfast everything else was a struggle, the equipment not being adequate to the space. Although there was a good pan and pots, you cannot use them at the same time as they do not match the size of the stove. No spatula, some other basics missing as well. The area around the hotel was not very clean, including the pool, that wasn't open over winter and had therefore been left out of cleaning. On our last day the spring cleaning seemed to have started and it looked and felt much better although still a lot to do. We had a North facing apartment which might be nice in summer for some coolness but was unfortunate now, as we had little direct sun and therefore the room did not really warm up. The air con that serves as a heating device as well did not manage any higher temperature in the room either. The beds were comfortable, the environment fairly quiet and the city center easily reachable. Cars from the airport and TGV Station arrive and depart just five minutes walk which is very convenient. We also liked the terrace adjacent to the room. Most of the staff were extremely nice and helpful just one lady seemed to have a constant bad humour. Special thanks to Sonya for great service! The location is really close to the 「Attractions populaires」, it is convenient to buy something to eat and shopping! Very comfy hotel with all necessities. Spacious apartment type room with kitchenette. I'm positively surprised and will be coming back. great price/quality ratio in Aix. the furniture in my room (212) was somewhat outdated. the shower and the electricity (socket) need an inspection. the bathroom had plaster coming off the wall; swimming pool not available; poor weather. I don't understand, why the rooms are cleaned, if you stay between 1 and 4 nights, but not at all, when staying for 5 nights. The breakfast was very good. We liked especially the waitress, Evelyne, who cared like a mother for her guest, asked, whether they wanted freshly pressed orange juice, how they would like their eggs, etc. Trying to get there! There are major works going on in the centre of Aix, with many roads blocked off and diversions in place. After a frustrating hour we did the only thing possible to reach the hotel, and went the wrong way down a bus only lane. The easiest approach is from the southern ring road, which takes you straight in without too much grief. Worth it even if you are arriving from the north. Quiet, comfortable modern hotel 10 minutes walk from the station and from the centre of Aix, and with it's own underground carpark. Suited us well as we could leave the car safely parked and walk in 10 or 12 minutes to concerts at the Conservatoire and Theatre. Didn't try breakfast. Very pleasant staff. the appartments were a bit shabby and would need some renovation. there was also a peculiar smell on the hallway and in the room.